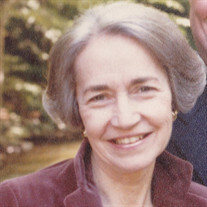 Georgia Garner (nee Trebilcock) was born in Madison, Wisconsin in 1923. She graduated from the University of Wisconsin in 1944. After college she moved to Chicago where she worked in the art department of an advertising firm. She met and married her first husband, James, soon after World War II. They lived in Boston while he attended law school, and later moved to Cleveland, Ohio. They soon started a family, raising four children: Gail Resch (Michael); Ann Croll (Sam); Tom Garner (Tamar); and Mary Ganske (Lyle). In the mid-1970's, when few of her contemporaries were entering the work force, Georgia took a job designing wallpaper at a local textile firm. Eventually, she opened a graphic art studio in Chagrin Falls, where she designed personalized cards and stationery. Georgia was a sports fan extraordinaire. While she liked every spectator sport, baseball was her passion. She had season tickets to her beloved Indians, and never missed an away-game on TV. She also continued to follow the Wisconsin Badgers, even attending the Rose Bowl to cheer them on in person. Aside from her passion for art and sports, Georgia was an avid reader and tennis player. Her husband, James, passed away in 1996, a month shy of their 50th wedding anniversary. Several years later, she met and married John Dwyer, who also predeceases her. Georgia was the oldest of three girls: Sidney Knopf (deceased) and Mary March (deceased). In addition to her four children, she is survived by seven grandchildren and one great-grandchild. In lieu of flowers, contributions can be made in her name to Laurel School, One Lyman Circle, Shaker Hts., OH 44122, the Cleveland Orchestra, 11001 Euclid Ave., Cleveland, OH 44106 or to Plymouth Church, 2860 Coventry Rd., Shaker Hts., OH 44120 where Memorial Services will be held at a time and date to be announced.